Kṛṣṇa was not talking here as Mr. Kṛṣṇa, who was born on a given day at a given time, but as Īśvara, the Lord. Throughout the Gītā, Kṛṣṇa talked as the Lord, except in one or two places where he said to Arjuna, ‘You are my friend.’ In fact, anyone who understands the nature of Īśvara can talk as an avatāra, as Īśvara incarnate, just as Vyāsa had Kṛṣṇa do in the Mahābhārata. In the fourth chapter of the Gītā, Kṛṣṇa himself talked about what an avatāra is, as we shall see later. Here, in this verse, Kṛṣṇa says that in the Veda, a twofold niṣṭhā was expounded by him. Niṣṭhā means a committed life style. For example, a person who is committed to the practice of japa, chanting the Lord’s name, is called japa-niṣṭha, and when performing austerities, tapas, is the emphasis in one’s life, the person is called taponiṣṭha. One for whom the pursuit of Brahman is the niṣṭhā is called brahma-niṣṭha — one whose commitment is to knowledge. In this verse, Kṛṣṇa says that one of the niṣṭhās or life styles he revealed to the world in the beginning is for the sānkhyas, the sannyāsis, and is in the form of jñāna-yoga, meaning that knowledge is the means to accomplish his end. Knowledge is the means for the jñāna-yogi who is the sannyāsī because he has no karma to do, other than the pursuit of knowledge, in order to gain mokṣa. The other niṣṭhā, karma-yoga, he revealed to the world in the beginning is for everyone else — karma-yogīs. Kṛṣṇa then revealed the two fold niṣṭhā to Arjuna. The word sāṅkhya means knowledge and is also used in the Gītā by Lord Kṛṣṇa to mean sannyāsa, the life of renunciation. Those who are committed to knowledge are called sāṅkhyas and the knowledge that is unfolded so clearly by all the Upanisads, the subject matter referred to as Vedānta, is called sāṅkhya. The only topic that Vedānta deals with is — ‘ātmā is Brahman.’ Therefore, sāṅkhya means Brahman and what is unfolded by the Vedas, by Vedānta, is called sāṅkhyam brahma. Because the knowledge of Brahman is called sāṅkhya, and those who pursue that knowledge are also called sāṅkhya, we find in the Gītā that the word is also used as a synonym for sannyāsa, the life style of renunciation in which knowledge alone is pursued. Because Arjuna wanted śreyas, mokṣa, Kṛṣṇa told him about this two fold niṣṭhā. Mokṣa is clearly the end in view and the niṣṭhā is a means to this end. The niṣṭhā is two fold because there are two different groups of people. One group is the karma-yogīs or just yogīs and everyone who does not live the life of renunciation. For these people there is karma-yoga whereas for sannyāsī there is jñāna-yoga. These two styles are in accordance with the four stages of life found in the Vedic culture. 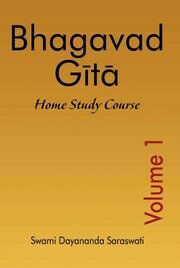 The first stage is called brahmacarya-āśrama, wherein the person lives a studious life with learning as the main focus. The brahmacarya-āśrama prepares one for the next āśrama , the gṛhastha-āśrama or married life. In Chāndogyopaniṣad we read that. Śvetaketu spent twelve years in the guru Kula, which he joined when he was twelve years old. So the first twenty-four years of one’s life comprise the first stage of the brahmacarya-āśrama. The second stage of life, gṛhastha-āśrama, where being a householder and raising a family is the primary focus, prepares one for the third stage, called vānaprastha-āśrama. In this stage the person remains married, but husband and wife live as friends, rather than as a married couple. 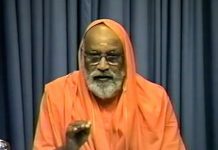 The person continues to perform the various rituals enjoined by the Veda for the householders, but withdraws from worldly activities and lives a contended life. The vānaprastha-āśrama prepares one for the fourth and final stage of life, sannyāsa, a life of renunciation. sannyāsa is the best retirement plan there is because you do not require money for it. You simply renounce whatever you have. Renunciation is possible at any stage. Arjuna who was in the gṛhastha-āśrama, wanted to renounce. 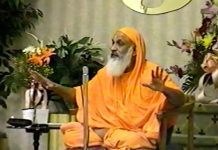 He did not want to go through the intermediary stage of vānaprastha. To remain as he was, meant that he would have to a gṛhastha for a length of time and then take permission from his wife to move on to the vānaprastha-āśrama, none of which would be easy. Nor was it necessary to do so, for the day a person wants to get out of any of the first three āśramas, it can be done. when one discovers the readiness, the dispassion, in oneself, on that very day, one can take sannyāsa. There is a Vedic sanction for it. The sannyāsa-āśrama is a stage in life where one is absolved from performing all karma. One is freed from all duties in order to pursue knowledge. This pursuit of knowledge is all that is to be done. Therefore, the person must already be a jñāni or want nothing but knowledge. There are two types of sannyāsa, for a person who is already a jñāni, there is vidvat- sannyāsa, a sannyāsa taken because of knowledge. The person has knowledge and therefore, there is nothing more for him or her to do in the world – no obligations whatsoever, If the knowledge has been gained in any of the three āśrama — brahmacarya-āśrama, gṛhastha-āśrama or vānaprastha-āśrama – the person can take to the sannyāsa-āśrama directly, taking vidvat-sannyāsa, so that he or she is no longer obligated. Otherwise, for the person with knowledge, there will still be obligations because each of the first three āśramas implies certain duties on one’s part, which cannot be left undone as long as one is in that āśrama. Thus, the person takes sannyāsa to be free of these obligations – to make it perfect, in other words. The other main type of sannyāsa is called vividiṣā-sannyāsa and is meant for knowing. This sannyāsa is for those who desire to know the self, ātmā, as Brahman. The person knows exactly what is to be done. He or she has heard that this ātmā is Brahman and wants to know it. Such a person is not interested in anything else and has a certain Viveka, discrimination, with reference to the real and the unreal. He or she also has vairagya, dispassion, mumukṣutvam. The desire for liberation, and other qualifications in various degrees. And with these qualifications, the person takes to the life of sannyāsa, called vividiṣā-sannyāsa. There is a third type of sannyāsa, called āpat-sannyāsa, when a person thinks he or she is going to die and does not want to die a gṛhastha or a vānasprastha, but rather as a sannyāsī, he takes āpat-sannyāsa. Āpat means danger. Because the sannyāsa-āśrama is always praised in the sāstra, its natural for a person to want the result of this āśrama. It is as though the person had a blank check all along and now wants to encash it. For one who has already lived a gṛhastha life and has been told that death is near, there seems to be no use in continuing in the gṛhastha-āśrama. A man who is not about to die will usually want to remain a gṛhastha because he is fond of his wife and children. But if he knows he is going to die fairly soon, he may go for āpat-sannyāsa. At such a time, one does not require a guru but can declare oneself to be a sannyāsī. With the sun, the elements, and all the gods as witness, one can make vows, for which there is a particular mantra. And if one happens to survive, the vows taken can always be ratified later. This is how Śaṅkara became a sannyāsī. 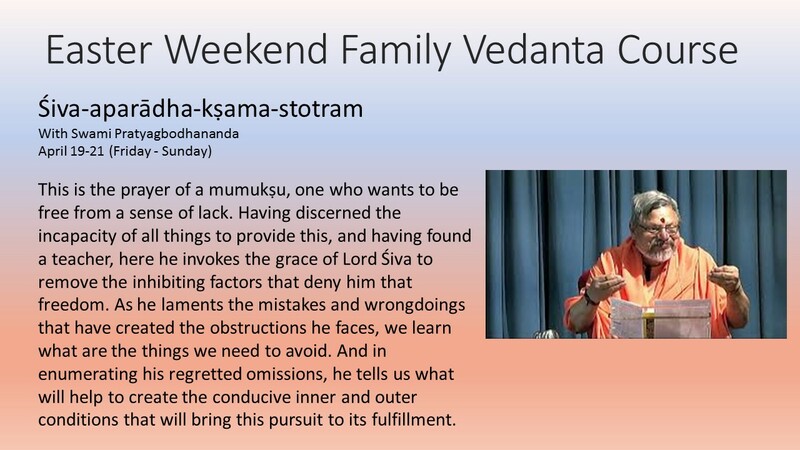 Śaṅkara wanted to became a sādhu at a very young age, but his mother was not at all agreeable. As the story of his goes, he had the help of crocodile that had caught hold of his leg while he was bathing in the river, Śaṅkara’s mother was waiting for him on the bank and he called out to tell her what was happening. It may have been a ploy or perhaps the crocodile was symbolic of saṃsāra, we do not know. In any case when his mother began crying, Śaṅkara told her that if he took the vows of sannyāsa, the crocodile would let go of him. Śaṅkara then took the vows and, lo and behold, the crocodile released him! Because there was danger to his life involved, this was āpat-sannyāsa. When he walked out of the river, his mother said, ‘Come on, let’s go home.’ ‘What!’ Śaṅkara replied, ‘I am a sannyāsī now.’ When his mother told him the vows were only for the crocodile’s sake, he said, ‘Not at all! I have made the vows and I am going.’ In this way, Śaṅkara became a sannyāsī. Later he went to the guru, Govinda-bhagavat-pada, who lived on the banks of Narmada in the middle of India, and became his disciple. It was Govindapada, who ratified Śaṅkara’s vows of sannyāsa. Ratification is always possible whenever one has taken āpat-sannyāsa and survives. Expecting some good end from the sannyāsa-āśrama, people have a value for it. This expectation is based on the belief that a sannyāsī does not take another birth. And if there is a birth, the hope is that one will get a better chance in the next life. This is a belief and one has faith, śraddhā, in it. 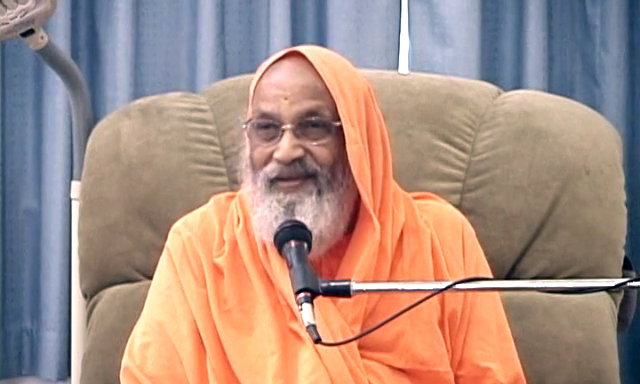 A person may be born into a family where he or she can start life as a sādhu, so that directly from the brahmacarya stage he or she will become a sannyāsī and not a gṛhastha. Thus, those who have become sannyāsī this way may have been āpat-sannyāsīs in their previous life. Arjuna’s heart was not in āpat-sannyāsa. He was not dying, but he did want to know. Therefore, he wanted to take vividiṣā-sannyāsa. In sannyāsa one gives up all karmas, for which there is a special ritual, the last fire ritual that a sannyāsī performs. You may see a sannyāsī doing a puja. But you will never see a sannyāsī sitting around a fire performing a Vedic ritual. Such a person has been freed of all obligatory fire rituals, of all karmas, in fact. A sannyāsī’s last fire ritual is one in which all karmas are given up. In this ritual, the sannyāsī bids goodbye to all the ancestors, to whom there has been an obligation – father, mother, grandfather, grandmother, great grandfather, great grandmother, then ṛṣis and devas. The person taking sannyāsa says that self-knowledge will be pursued to the exclusion of all else, asks for the blessing of paternal and maternal ancestors, and takes a vow of abhaya, a vow not to harm any living being, including trees and plants. The sannyāsī also vows to be a non-competitor in this world and all others, thereby becoming a person who does not compete for the sake of status politically, economically, Or socially. Knowledge is the only interest for the sannyāsī. Having taken their vows, the sannyāsī takes a few symbolic steps towards the north, the direction that stands for mokṣa. South stands for death. Thus, Lord death, Lord yama, is a southerner. This symbolism may be based on the polar attraction in the north. Death never attracts you, whereas freedom from death does. Moving towards the north in search of mokṣa, having discarded all clothing, the sannyāsī is called back by the guru, given a set of simple clothing, and asked to serve and continue studying with the guru. This, then, is the ritual of sannyāsa, be it either vidvat-sannyāsa or vividiṣā-sannyāsa. Both are mentioned by Śaṅkara in his commentary. In vidvat-sannyāsa, one may or may not take sannyāsa formally. The main aim is that, by knowledge, one gives up all karmas. The knowledge is that ‘I am a non-doer. I perform no action.’ This is what is called naiṣkarmya, the state of actionlessness. I perform no action at any time because ātmā, which is ‘I,’ does not perform any action. Nor does ātmā cause anyone to perform action. I am not a doer in spite of all the actions I do. This knowledge is real sannyāsa, described as jñāna-karma-sannyāsa. For the sake of this jñāna-karma-sannyāsa, one takes to the life style of sannyāsa, pursuing self-knowledge. The other niṣṭha, karma yoga, is for all those seekers in the other āśramas. There is no doubt that karma binds, with its limited results. But if you do karma for antaḥ-karaṇa-śuddhi, for neutralizing your rāga-dveṣas, for gaining the grace of Īsvara – If you perform your prayers, rituals, and duties for the sake of these alone, the karma you perform becomes a means, yoga, for mokṣa. Sannyāsa is only possible if you lived a life of karma yoga. Otherwise, if you become a sannyāsī who has rāga-dveṣas, you will be miserable. A karma-yogi has the means, a world, a field, where his or her rāga-dveṣas can be neutralized. Such a field is not there for a sannyāsī. Sannyāsa means a life of study from morning to night. No other activity is available. A sannyāsī cannot even sing much because the pursuit of music, along with everything else, has already been given up. A sannyāsī is one who has to pursue knowledge for which a certain capacity to contemplate is required. If the pressure from rāga-dveṣas is there, you cannot sit in contemplation. You will find, instead, all kinds of agitation or you will fall asleep. After a few days, the lifestyle of a sannyāsī traditionally indicated by wearing of orange robes, will become a source of irritation. Naturally, then, Sannyāsa is meant only for those who, to an extent at least have taken care of their rāgas and dveṣas. The two-fold niṣṭhā is meant only for śreyas. Arjuna wanted Kṛṣṇa, to tell him which one was better and Kṛṣṇa replied that one can be a sannyāsī or a karma-yogi. Both are meant for the same end – mokṣa, Śreyas. One can live a life of karma-yoga and gain mokṣa and one can live a life of sannyāsa and gain mokṣa. The only difference is that for a sannyāsī there is only knowledge, whereas for a karma-yogi there is knowledge and karma. This difference must be understood well because this is where there is a lot of confusion. Arjuna was a karma-yogi, not a sannyāsī. By listening to Kṛṣṇa, he was pursuing knowledge. Although gṛhasthas pursue other activities, they can be qualified for knowledge. This pursuit of knowledge plus the performance of karma, with a certain understanding, made Arjuna a karma-yogi. If the pursuit of knowledge had not been there, if he had no discrimination, if mokṣa had not been the end for him, he would not have been a karma-yogi. He would have been a simple doer, a karmī, a karmaṭha. When mokṣa is the end in view, then karma becomes yoga because it is done with a particular attitude in order to gain antaḥ-karaṇa-śuddhi, purification of the mind. In this way, karma yoga is important in gaining knowledge. You can take sannyāsa and gain sarva-karma-sannyāsa or you can live a life of karma yoga and gain the same thing. Sarva-karma-sannyāsa is an end in itself for which the means is knowledge, gained in either of the two life styles — sannyāsa or karma yoga revealed by the Lord in the beginning itself, in the Upaniṣads. Among the ten Upaniṣads commonly studied, the first one is Īśāvāsyopaniṣad. The first mantra of this Upaniṣads is meant for the sannyāsī, the jñāna-yogī. It says, ‘In this moving world, everything should be looked upon by you as Parameśvara, the Lord — īśāvāsyamidaṃ sarvam. The Lord being everything, what is there that is yours? Or, not yours? 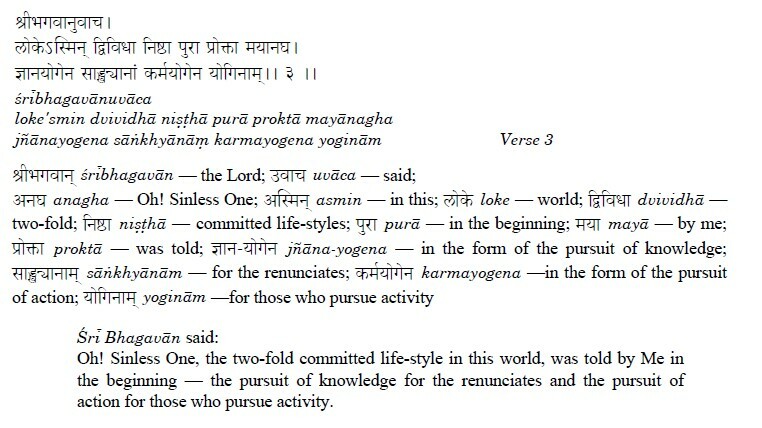 Live a life of renunciation and pursue self-knowledge alone,’ this mantra enjoins, Pursuit of this knowledge, giving up every other pursuit, is the life of sannyāsa or jñāna-yoga, says Śaṅkara, in his commentary. The second mantra of the same Upaniṣad says, ‘Even if you want to live one hundred years, live doing karma with the proper attitude. This is the best way for you. If karma is done in the proper way, it will not affect you at all.’ This is karma yoga. Thus, we see here the two-fold niṣṭhā being unfolded, sannyāsa, wherein the pursuit of knowledge alone is allowed, and karma yoga, the pursuit of knowledge along with whatever karma is to be done. Throughout the śāstra, these two niṣṭhas are always discussed in the same way. In the Vedic vision, Śreyas is mokṣa. mokṣa is the end, the human destiny to be gained in this life. Here, itself, saṃsāra is crossed. To have taken a human birth means that you have already made it. Because you have an intellect, buddhi — viveka is possible. It is true that experience teaches, but you do not need to get knocked around for seventy-five years develop discrimination. Twenty-five years is good enough! Once you develop viveka, Śreyas alone looms large before you; it becomes the only real end for you. Then you become either a karma-yogi or a sannyāsī. The niṣṭha was given in a two-fold way because there are two kind s of people. But there is only one means of mokṣa, knowledge. Depending on the kind of person you are, you can be either a sannyāsī and pursue knowledge to the exclusion of all else, or a karma-yogi and pursue knowledge along with karma. In both life styles, the pursuit of knowledge is common. Knowledge is mokṣa. Therefore, the choice is not between jñāna and karma. It is between sannyāsa and karma yoga. When the choice is between karma yoga and sannyāsa. Given a choice, why do karma at all? Sannyāsa seems to be the better choice since performing karma implies so much effort, problems, and even bloodshed, in Arjuna’s case. Karma can be such a nuisance. When two life-styles are available, why should I put up with the life of karma? The choice is like asking which is the better way to catch hold of my nose in order to do breathing exercises. Shall I take my hand directly to the nose or shall I reach around from behind my head? It can be done either way, but when the first way is obviously so easy where is the question of choosing? Sannyāsa seems to be easier – just give up all the karmas and pursue knowledge. Why do both? A karma-yogi living in an agricultural society, for example has to milk the cow, graze it, wash it, and take care of the children, among other things. One child is crying, the other is on his lap, and the third one is tugging at him from behind. The mosquitoes are biting and his wife is shouting. In between he has to perform the fire ritual, called agnihotra-karma, with all its problems. The firewood is wet, everything is smoking, and his eyes become filled with all kinds of tears – tears born out of the smoke, tears born out of all the nagging children, tears born out of helplessness, and so on. When will such a person have time to pursue knowledge? Whenever he picks up the Gītā book, all that comes is sleep! Is it therefore not better to go for sannyāsa? Arjuna thought so. However, sannyāsa is not as easy as it appears. It looks as though you need only sit and study. But try it and you will find that it does not always work that way. Instead you may vegetate all day because you are not able to study so intensively. This, then, is not the way. Thus, Kṛṣṇa continued to tell Arjuna exactly what sannyāsa and karma yoga are. Even though a choice is there, karma yoga will pave the way for sannyāsa. It will even pave the way for the desire for knowledge and, therefore, for vividiṣā-sannyāsa. Kṛṣṇa told Arjuna that sannyāsa is not at all easy in spite of how pleasant and simple it appears to be. After all, sannyāsa is giving up everything. Arjuna thought that giving up everything would not present any great problem, especially since he had lived in the forest for twelve years. But, during those twelve years, he had been thinking about Duryodhana and the kingdom, and the injustice of it all. Twelve years of meditation upon Duryodhana did not make Arjuna a sannyāsi. Arjuna had been nursing a big hurt for a long time. Therefore, sannyāsa was not going to come so easily to him. One does not become a sannyāsi by decision alone – all of which Kṛṣṇa would tell him in the Gītā.